Rawlings Worth Sporting Goods Company, Inc. is a leading manufacturer and marketer of sporting goods in the United States. Since the company’s inception in 1887, Rawlings’ mission has always centered on enabling participation by developing and producing innovative, high-performance equipment and protective apparel for the professional, amateur and entry-level player. Rawlings’ unparalleled product portfolio into their sports: as the Official Baseball Supplier and Official Helmet of Major League Baseball®, the official baseball of Minor League Baseball, the official baseball and softball for the NCAA®, and the approved baseball, basketball, football and softball of the National High School Federation®. Star Sports Korea has a 50 year tradition obtaining various approvals for Star ball products by the Internation Fedeartions such as FIFA, FIBA, FIVB, ITF, IHF, National Associations and thus are qualified to supply official game balls sponsored by the nternational Federation or the National Associations. 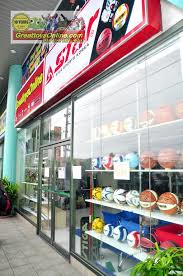 STIGA Sports AB, a global company with partners in over 100 countries. The classic Swedish table tennis company with both hobby and professional products. In 1944, STIGA started its production of table tennis products and is today established as one of the world's largest brands of table tennis. STIGA also offers a wide range of outdoor and indoor sports items with classics like Snowracer® and the Play-Off table hockey games. The head office is located in Eskilstuna. STIGA has since many, many years a very good and close relationship with The China National Team. One of the main reason is STIGA´s long tradition in table tennis – the oldest table tennis brand in the World. STIGA sponsors Chinese National Team Players - Xu Xin, Fan Zhendong, Guo Yue, Zhu Yuling. STIGA Classics, Hardwoods, VPS, Carbonado, Nostalgic are just some of the world renowned handmade quality blades from Sweden and innovative thinking with classic design, just the way we want to cherish our legacy of building world champions since 1944. KT Tape® based in American Fork, Utah and founded in 2008, has revolutionized the sports medicine industry with the introduction of the most advanced and recognized kinesiology tape and recovery products. KT Tape ® is recognized as a leader in sports related pain and injury treatment. The mission of the company is to develop breakthrough solutions to help enable athletes to compete at their best. KT Tape has become the athlete’s choice for drug free pain relief and injury management. The Company currently designs, develops, and distributes a variety of kinesiology tape lines, including KT Tape ® Original (cotton) and KT Tape ® Pro ™ (synthetic), engineered for targeted pain relief* and enhanced functionality, as well as a lines of performance and recovery products. KT Tape is the largest kinesiology tape manufacturer in stores, available in 42,000+ domestic retail locations and 40 countries. Ultrak based in California, Ultrak offers a huge line of stopwatches to fit any timing need. An Ultrak stopwatch represents the ultimate balance of value and performance. From the most basic to printing and downloadable stopwatches. Target Darts in 2006 and have since built a reputation for fresh, innovative design, premium product quality and impeccable craftsmanship. By creating exceptional products and working with the best in the game, it is our mission to inspire people to step beyond their limits, improve their performance and experience transformative impact. They sponsor some of the World's leading players on every continent, from the UK, through Europe and North America and throughout South East Asia and Japan. Targets player portfolio now boasts an incredible 6 world champions, including current world champion Rob 'Voltage' Cross and none other than 16 x World Champion, Phil 'The Power' Taylor. YASAKA Co. Ltd. was founded by Mr Hirosi Yaoita and Mr Sakamoto who gave the name of the company (YAoita + SAKAmoto). Mr Yaoita was a table tennis player and his aim was to offer table tennis players products with high tecnical quality and superior. Yasaka revolutionized the table tennis rubber technology and introduced MARK V. Winning the men´s single in the 1970 European Championships and 1971 World Championships MARK V started a victory road in table tennis all over the world. Yasaka RAKZA 7 was introduced in the spring 2010 and has became a major sales success. An increasing number of players are changing their rubbers to Rakza 7 and Rakza 7 Soft. In connection with the WTTC 2012 in Dortmund Yasaka released the third version of Hybrid Energy rubbers, Rakza 9 and in 2014 the Rakza X was introduced. Newgy Industries, Inc. is the world leader in table tennis (ping-pong®) robots ― also known as table tennis ball machines/launchers/throwers. Newgy is renowned for high quality, smartly engineered table tennis products that are also affordable and user-friendly. In addition, Newgy manufactures and sells a variety of other table tennis supplies including balls, paddles/rackets, table nets and ball catch nets, court barriers and robot accessories. Newgy’s flagship product line, Robo-Pong table tennis robots, are available in several models, making it ideal for all levels of play. Everyone from recreational ping pong players to competitive club level to professional table tennis athletes can enjoy and benefit from playing, practicing and training with the Robo-Pong. Take your game to the next level ― train strokes, footwork, transitions and develop other table tennis skills with Robo-Pong!